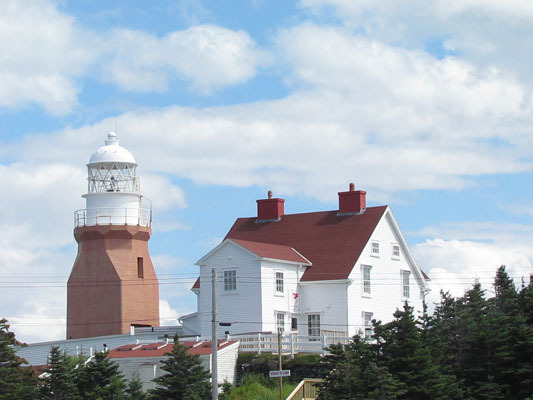 Maine, Newfoundland, Nova Scotia, Prince Edward Island and New Brunswick filled our August calendar. It included friends from Kentucky and Ajijic and a whole lot of sightseeing. These maritime states and provinces are not only beautiful to tour, they have a rich history, lots of fascinating people and they provide a unique glimpse at the formations of Mother Earth. 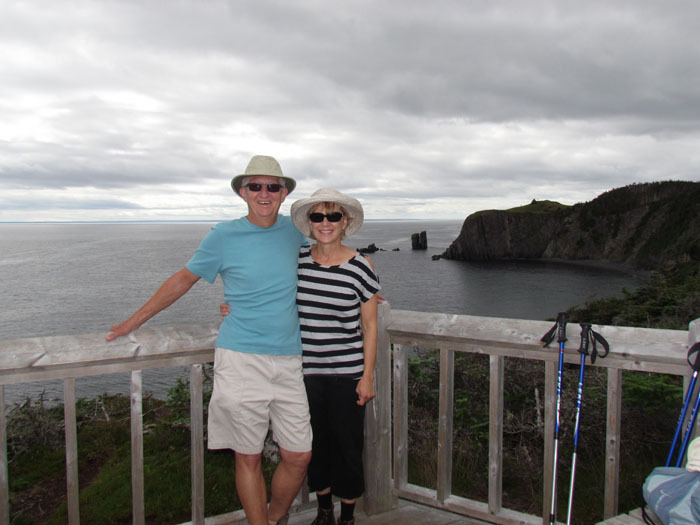 Here we stopped to visit with other hikers along the Sherwink Trail--ranked as one of the better trails overlooking the ocean on the north coast of Newfoundland. Larry's buddy Scott from Kentucky flew in and joined us for a few days in our RV while we were in Maine. 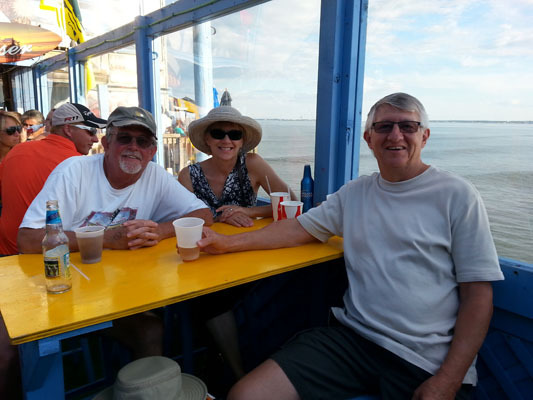 Here we took in the sights, some great music and a few beers at Old Orchard Beach, a popular hangout south of Portland Maine. We joined up with about 50 other tourist on a boat on Casco Bay, outside of Portland. Along with seeing several lighthouses, and lots of sail boats we enjoyed watching these lobster fishermen catching our meal for the evening. 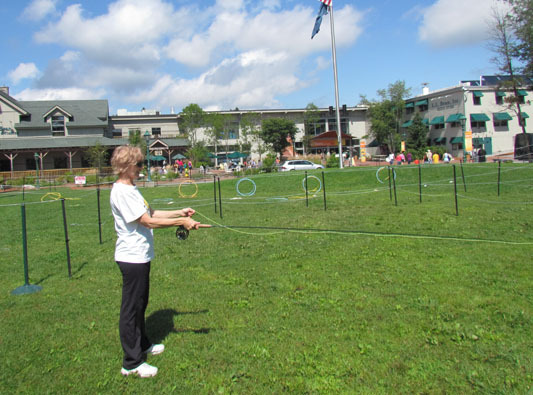 We joined Scott in a Fly Casting School put on by LL Bean, one of Maine's signature store for outdoor clothing and toys. Glorine was the only women in the class and got lots of kudos for her casting style from our instructor. 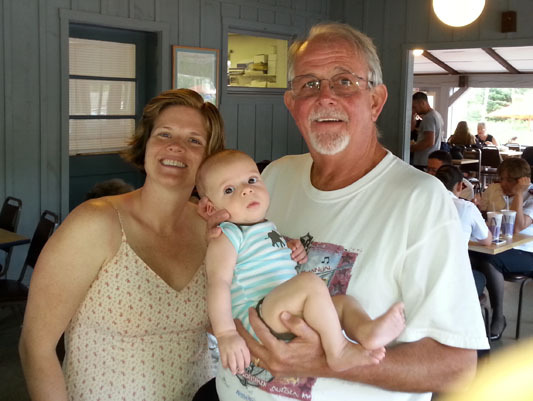 Scott and us met up with Brenda, her husband and baby boy at a local lobster restaurant. Brenda and Scott's daughters, Stephanie, are best buddies since serving together in the Peace Corp in Latvia. 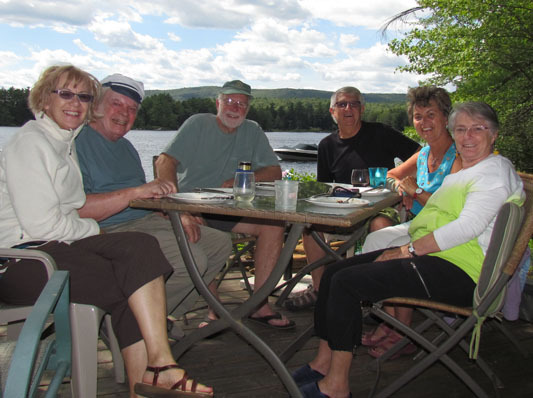 We joined Ajijic friends Ron and Jean Mullenaux at their cabin in central Maine. 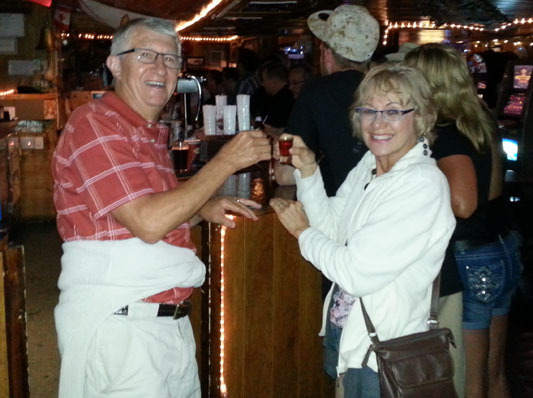 It was serendipitous that mutual friends Peter and Sybilla Mannsfeldt (who own a time-share in Maine) were there to share some good times together. The weather was great and the view off their deck was fabulous. From Maine we drove to northern Nova Scotia and took our tow car on a ferry to Newfoundland, where we stayed at B&Bs for 12 days. Our first stop were some small fishing villages on the southern coast, mostly withering away, as we learned that small fishing has gone away much as small farming back home. 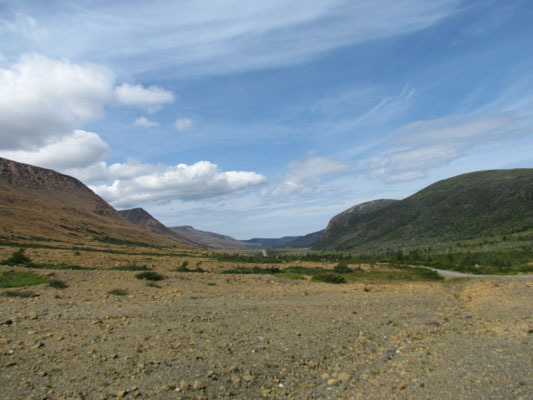 Gros Morne National Park on the west coast of Newfoundland is a geologist's paradise. and one of the most beautiful places on earth. This display depicts the layers of the earth from modern day (on top) back 540 million years ago. Here at Green Point, geologists have discovered a 180 foot section of limestone layers that date back 30 million years. 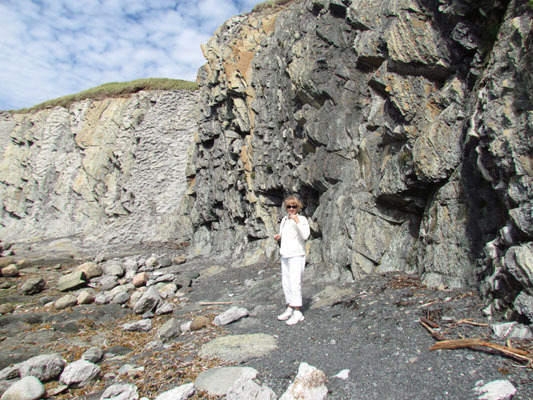 Glorine is standing alongside this massive section of the earth's layers on the shore of the Atlantic Ocean. It appears as if this section of the earth's crust was thrust into the air and fell on its side: putting earth's history on display. It was just one of several remarkable sights we learned about while visiting this national park. The most awesome site was Western Brooke Pond, once a salt water fjord, re-created into a fresh water pond. 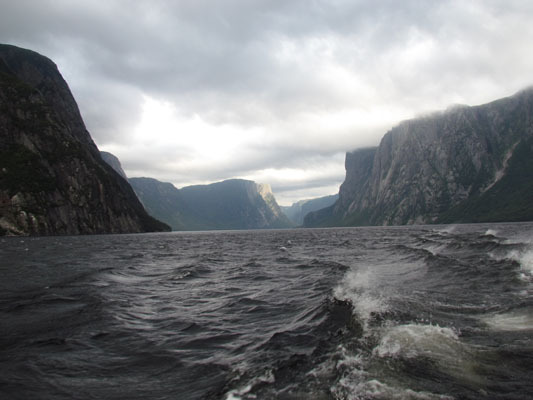 Gros Morne is French for "large mountain" (about 2,000 feet high) and the northern most point of the Appalachian Mts. The lake with depths up to 500 feet, made for the most specular tour. Like those two sites were not enough, scientist have recently discovered that the southern mountain (on the left) is actually part of the earth's mantle, which was forced up from the depths of the earth during a plate collision several hundred million years ago. 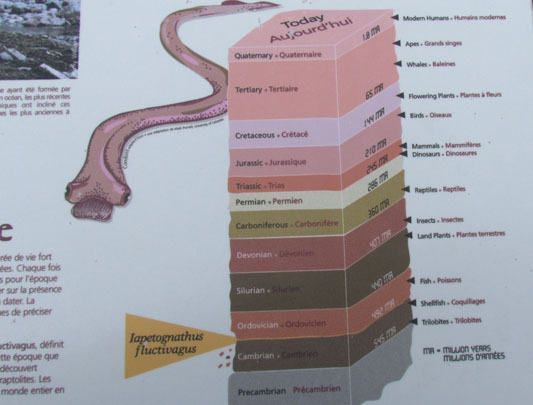 Its minerals are such that it does not sustain plant life. Newfoundland is an island the size of Montana. With over 18,000 miles of shoreline and 7,000 tiny islands, it had over 100 lighthouses. Many are now closed, but the keepers inn at this one had an unique exhibit on the Titanic and icebergs, which brought the unsinkable to the bottom of the ocean. 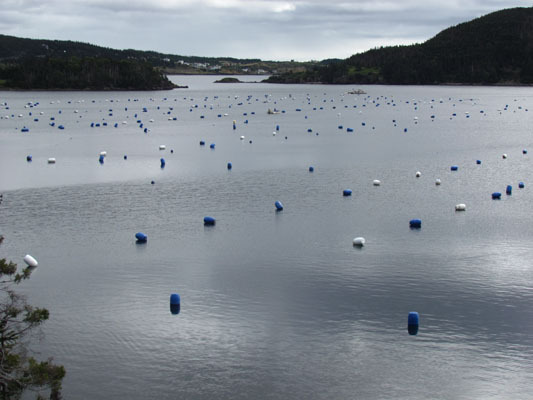 We were surprised to learn that these buoys, are a part of an enormous mussel farm. The cold waters of the north Atlantic makes this bay along the Bonavista Peninsula of Newfoundland a perfect place to raise these delicious creatures. There are two boats with fishermen out there checking their traps. As we hiked along Sherwink Trail we took this picture of Trinity, one of the cutest villages in all of our Canadian travels. Established in the early 1600s as a fishing village, it is now a tourist destination, with historically restored shops, museums, restaurants, churches, a live theaters and its own lighthouse. 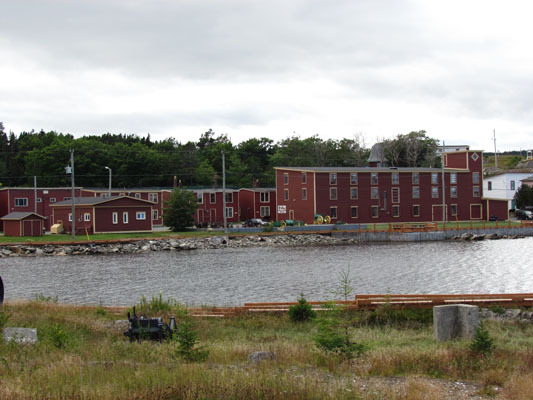 Port Union bills itself as the only "union built town in North America." The Fishermen's Protective Union was founded to break the stranglehold that greedy merchants had on salt fish prices and trade. 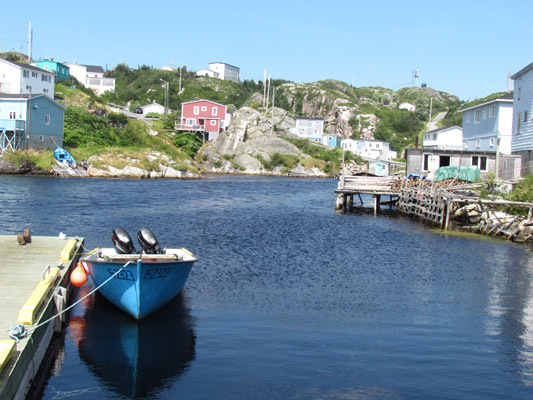 The town housed both fishermen and processing plants and at one time had as many as one half of all the fishermen in Newfoundland. Root cellars were structures built in the days before refrigeration to keep vegetables cool during the warm summers and keep them from freezing in the winter months. 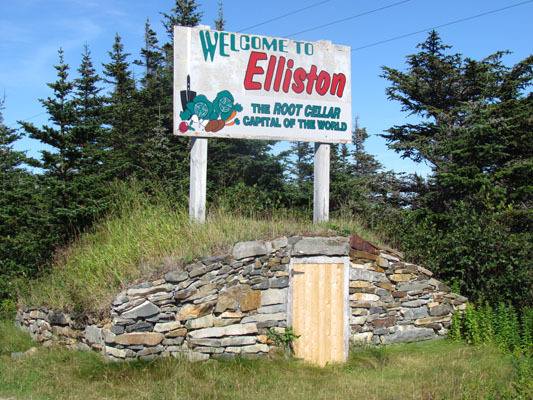 We found this town that boasts of having over 130 cellars, thus being the root cellars capital of the world. Some are still in use! 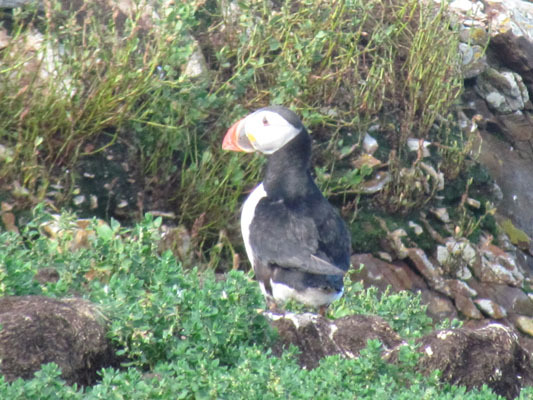 Near Elliston, we saw our first Puffin. These fascinating birds are unique to the north Atlantic. While they resemble a penguin from the neck down, their cute bill truly sets them apart. They spend their summers raising their young, one egg per season, and winters floating and fishing in the Atlantic Ocean. 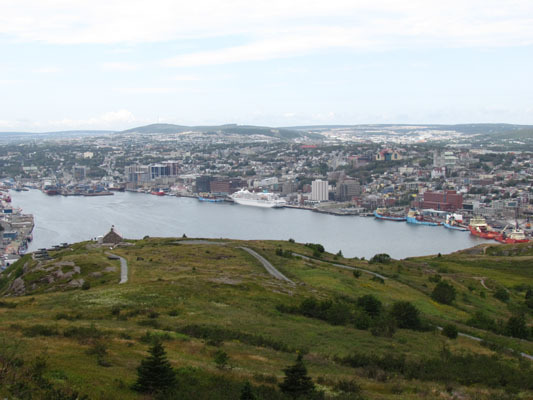 St. Johns is the capital and largest city in Newfoundland and one of the oldest English-founded city in North America. 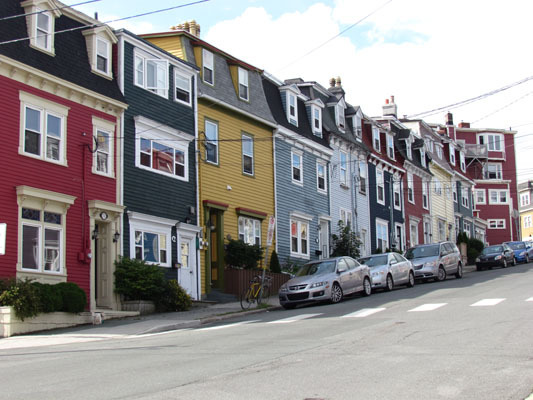 Another thing unique to St. John's is the many streets downtown that are lined with Jellybean Row Houses. 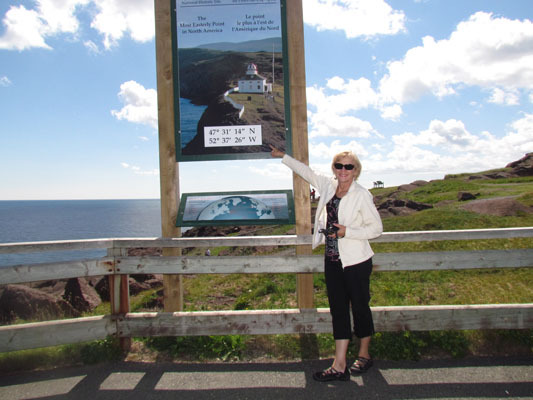 Glorine is standing at Cape Spear which makes it the easternmost point in Canada and if you don't count Greenland, it is the easternmost point in North America. 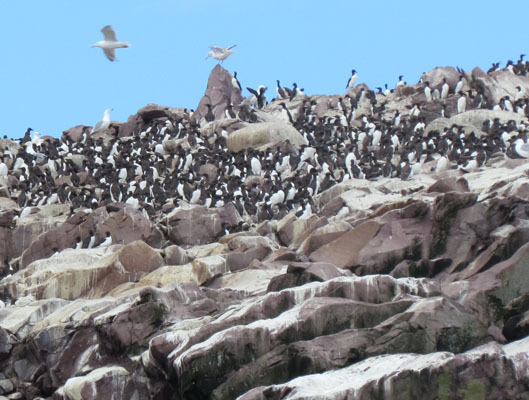 On a whale watching and Puffin cruise off the coast of Newfoundland we were most amazed to learn about Murres. Our tour guide said these birds are North American cousins to the Penguins, however, these birds can fly. They exhibit many of the same characteristics as Puffins. One night, we joined 30 other people to get "screech-in." It is a ceremony performed on non-Newfoundlanders (known to Newfoundlanders as a "come from away" or "mainlander") involving a shot of screech (which is a bad rum), a short recitation, and kissing of a cod. We are now official Newfies! 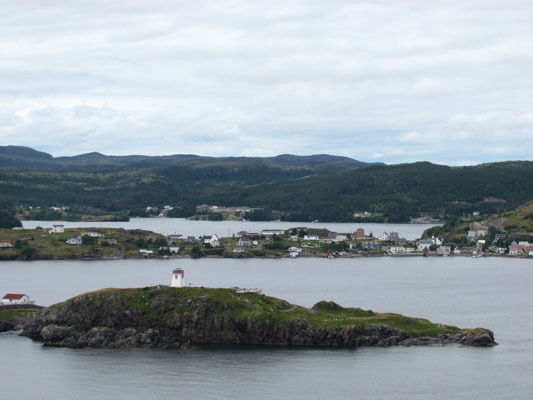 St. John's has a deep water port that is nearly land locked if not for the Narrows which is wide enough to allow massive ships to enter. In the center of this picture is a German Cruise Ship, which was docked for less than 12 hours. 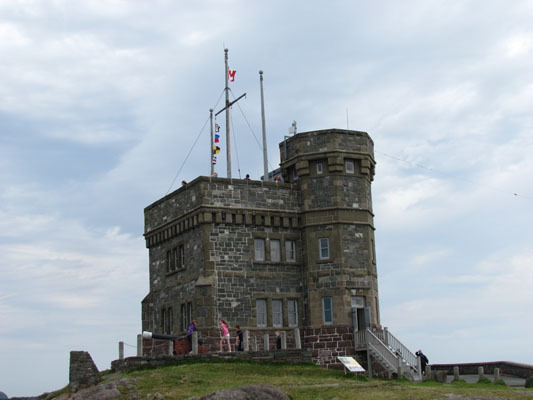 Cabot Tower sits on top of the inlet to St. John's harbor called Signal Hill and overlooks the city of St. John's. It is named for John Cabot, an Italian sailor in the same period as Christopher Columbus, but sailed under the British flag in the north Atlantic claiming New Found Land for England. 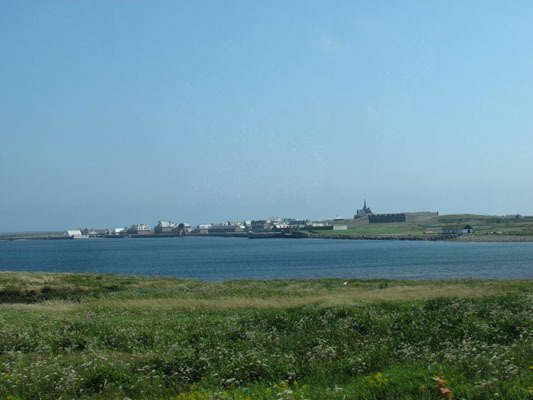 Our first stop in Nova Scotia was the Fortress of Louisbourg, a French fishing and fur trading settlement founded in 1713. After decades of conflict with England, the entire city was destroyed and laid in ruins until 1973, when Canada undertook the largest reconstruction project in North America. Dozens of buildings were constructed using original blueprints. Quite an incredible feat! Throughout Maine and the maritime provinces scenes like this are commonplace. 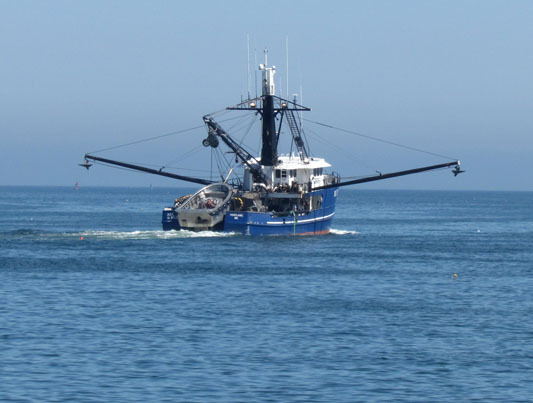 It was another great lobster season, more for the consumer than the fishermen. 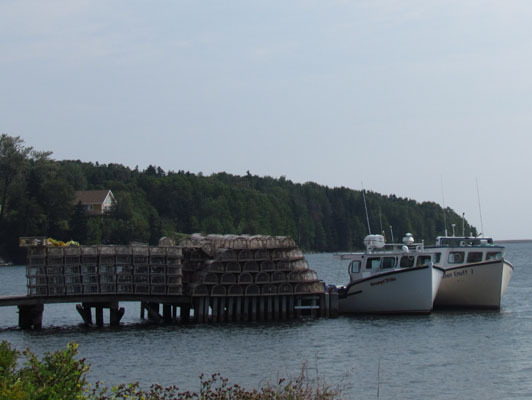 For the past couple of summers, huge lobster harvests, believed by some to be a result of global warming, have glutted the market. This season, lobsters--off the boat--were selling for as low as $2.50 a pound. Touring the Cabot Trail in the rain was disappointing but it gave us some extra time to tour the Acadian village of Cheticamp. A local museum featured the work of Elizabeth Lefort. 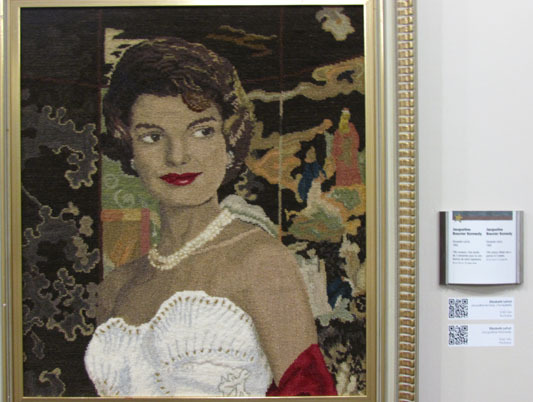 This may look like a painting of Jacqueline Kennedy, but it is a hook-rug done in 1962. It took her three-weeks to do, using 108 colors. Hmmm hmmm! Dinner time at an Acadian restaurant! We choose the Acadian sampler, Gabriel, to share. 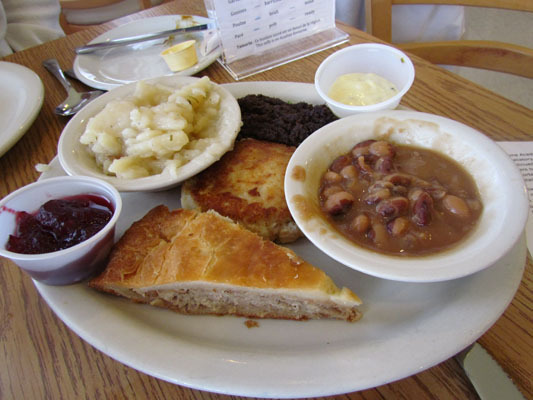 It consisted of meat pie, beans, fish cake, poorman's chiard (similar to potato salad) and blood pudding. Glorine was kind enough to give Larry all the blood pudding. Hmmm hmmm! 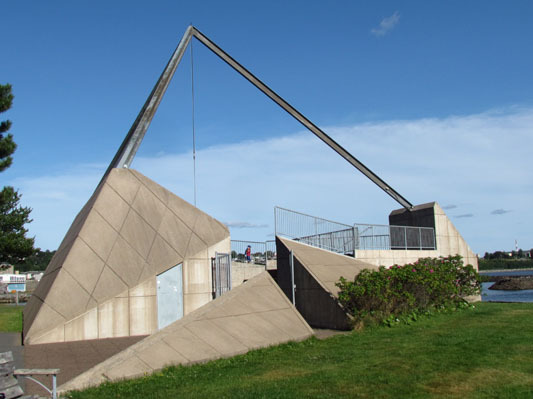 While biking around Halifax, we stumbled across this memorial called the World Peace Pavilion. It was officially opened by the foreign ministers meeting at the G7 Summit in 1995. The triangular shaped structure displays an international collection of rocks and artifacts from 80 countries from around the world. Nice to see a memorial dedicated to peace. We met up with another Ajijic friend, Shiz Katayama. After treating us to a five course dinner, we spent the evening in her corner apartment overlooking the city of Halifax, reminiscing about all the people we mutually knew from Ajijic. 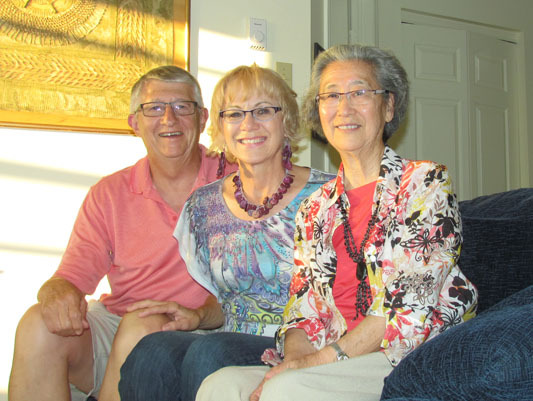 After 13 years of living full time in Ajijic she decided to live closer to her family and has made Halifax her new home. With 70,000 visitors coming to Peggy's Cove Lighthouse each year, it's no wonder that it is the most photographed lighthouse in Canada. 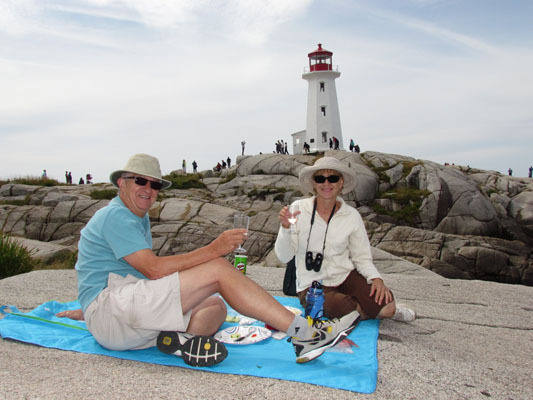 Sitting atop granite rocks, this lighthouse made a great backdrop and great place to have a picnic. 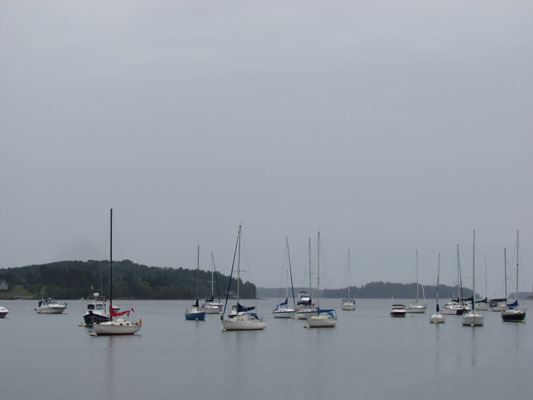 As we drove down the coast of Nova Scotia, we found this cute little village called Chester lined with sailboats. What was surprising was most were owned by Americans who have made this little slice of heaven their summer get away. Life at sea can be tough and for many, they don't make it back home. 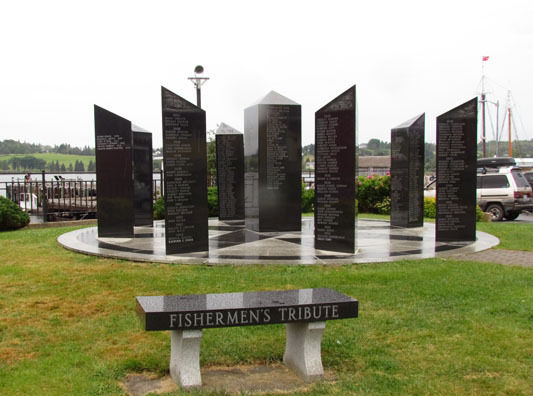 Lunenburg, Nova Scotia created this memorial to fishermen lost at sea. It is in the shape of a compass and has names engraved on granite columns. Bluenose, Canada's most noted fishing schooner and undefeated racing champion was initially built in Nova Scotia in 1921. 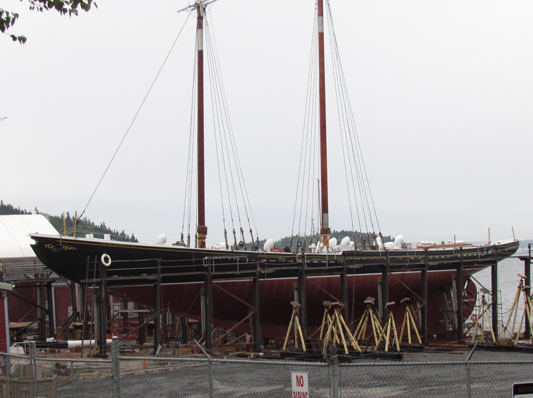 This version is the third life size replica nearing completion in the shipyards of Lunenburg. 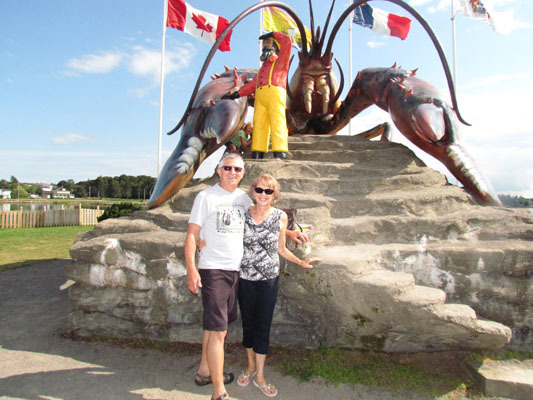 In northern New Brunswick, we drove along the Acadian Coastal Highway and then biked around the city of Shediac, which sports the largest lobster in the world. We could not resist having this photo taken with it. The plight of the Acadians were spread throughout the Maritime provinces. 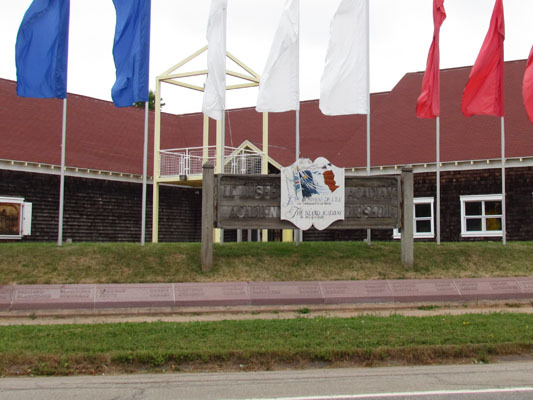 Here in Prince Edward Island we toured a museum dedicated to the early French settlers, their brutal deportation after Britain won the Seven Year War with France, and their repatriation back into Canada. It is terrible what we do to one another in the name of nationalism. There are creative farmers in PEI that do more with bales of hay than feed them to their cattle. 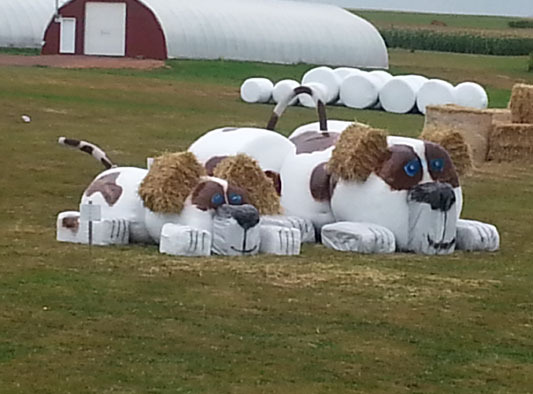 This was the cutest of several bales exhibits we saw We found this cool and very unusual place as we drove the country side of PEI. 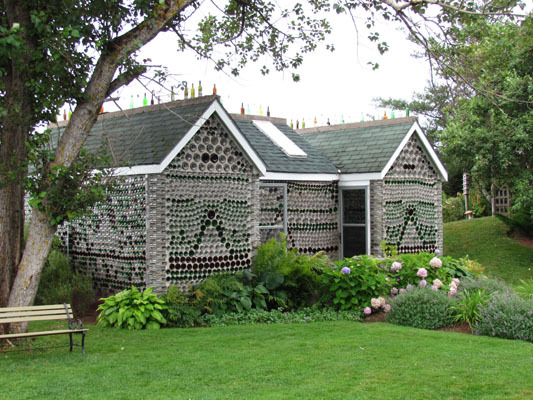 It had three buildings each made with bottles. Each building has about 10,000 bottles of all size, shapes and colors. This one is called 6 gables. The other two were a chapel and tavern--nice combination. 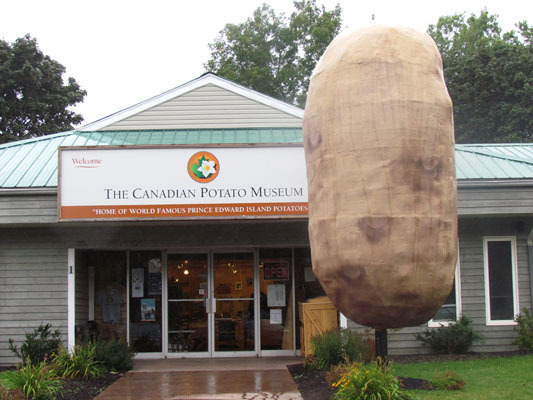 OK, we lived in Idaho and when we learned that PEI was famous for their potatoes, we decided to take in the Potato Museum. After sampling their baked potato, we agreed that their potatoes came in a distant second to those grown in Idaho. 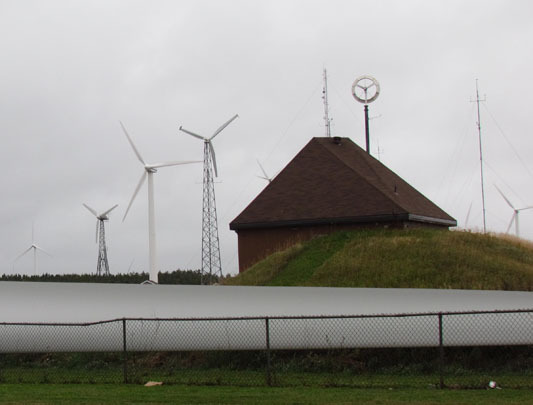 Canada's Wind Energy Institute in northwestern PEI was fascinating to tour. Started during the energy crisis of the 70s, it is used to test wind turbines in the harshest of environments, including salt spray, extreme cold and high winds. And yes, it gets awful windy! The coolest B&B we stay at was the Keeper Inn, located on the second floor of this working lighthouse. There, we met the most interesting couple from Portsmouth, NH, both in their mid-40s who spent the past ten years sailing around the world. What a fun and truly unexpected evening!! We exchanged contact cards and hope to meet up with again. Anyone remember Anne of Green Gables. Well the author Lucy Maud Montgomery grew up in PEI, and the Province built a village dedicated to her stories of Anne. 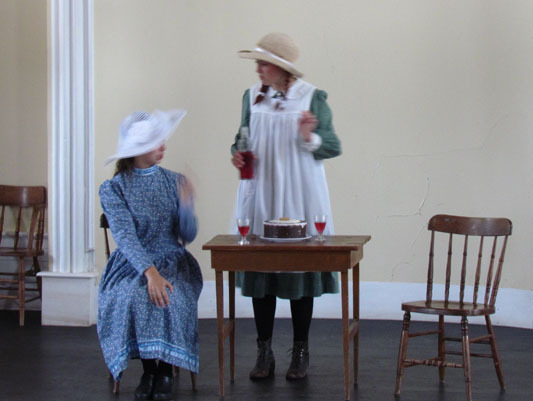 It is made up of a dozen buildings which is a re-creation of the events that occurred as Anne grew up. We watched a skit where Anne mistakenly gave her friend Diana, an alcoholic drink. Too cute!! 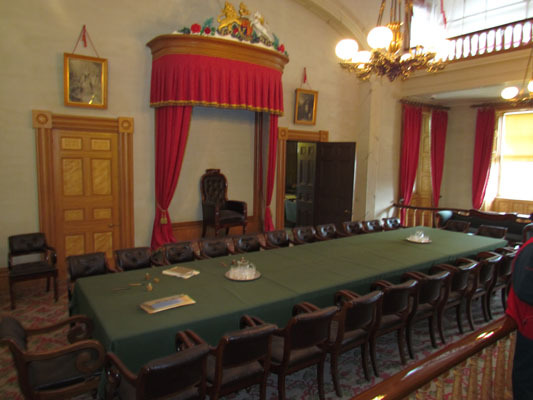 In 1864, representatives from the colonies of British North America met in this room in Charlottetown PEI to begin discussions on creating a confederation, which eventually lead to the creation of Canada three years later. The building was and continues to be the seat of the provincial government of Prince Edward Island. 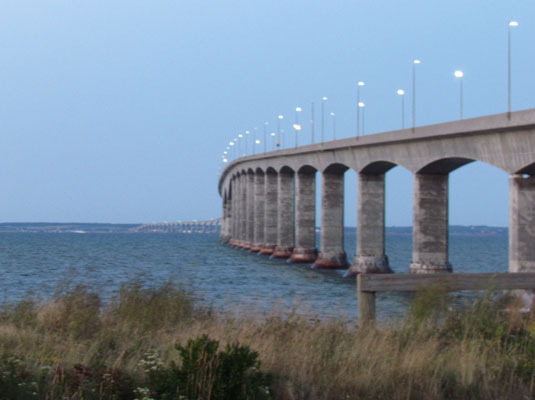 Prince Edward Island has both a ferry crossing and this bridge that spans the eight miles between it and New Brunswick. 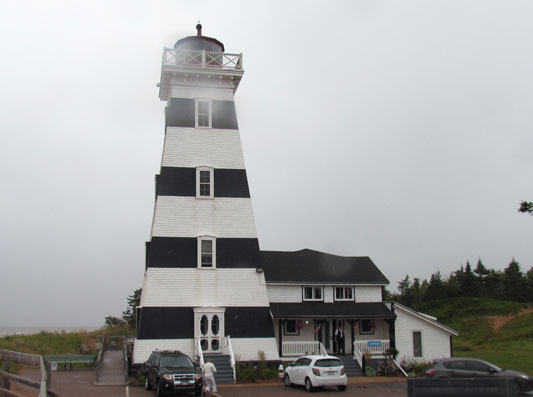 When we drove to PEI we were surprised to find there was no toll. When we drove back to the mainland, the toll was $50.00. PEI is like a lobster trap, easy to get in but harder to get out. 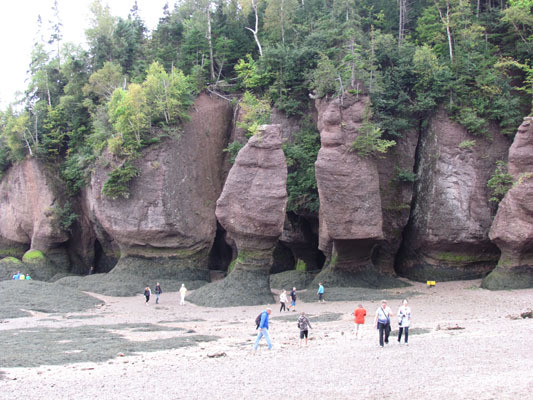 The waters between Nova Scotia and New Brunswick is called the Bay of Fundy, which has the highest tides in the world. Hide tide happens twice a day and can rise here as much as 52 feet. After the tide dropped, we walked the ocean floor and explored the rock formations (called giant "flowerpots") that were created by the constant flow of the ocean tides. While not quite as stunning nor as long as the Confederation Bridge, these old relics are still pretty cool. 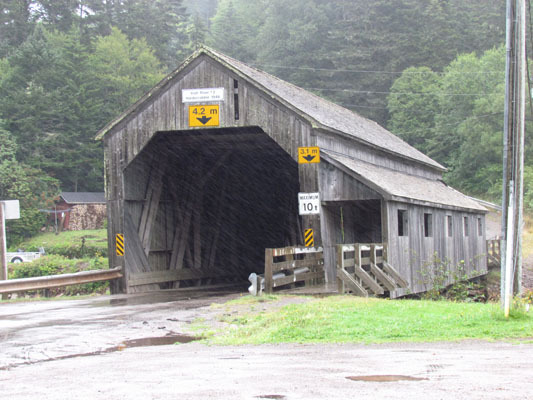 New Brunswick boasts of having 60+ covered bridges, one being the longest in the world. We drove over three covered bridges while exploring the Fundy National Park. This one even has a pedestrian lane. One thing we were surprise to learn was the large number of people who fled the USA following the American Revolution. Estimates range as high as 20% of these "Loyalists" left the country, many created new cities throughout British North America (now Canada). One of these is St. John, New Brunswick. 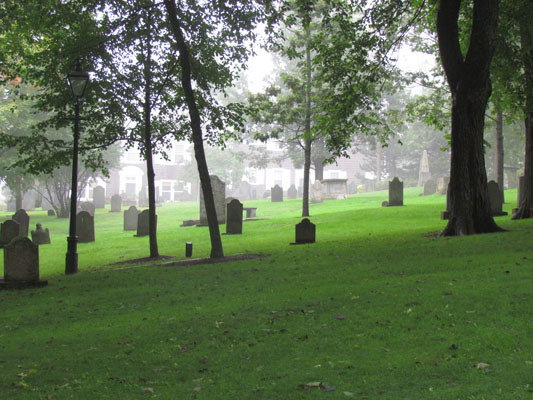 This cemetery, in the city center, is where many of the founding fathers and mothers were laid to rest. 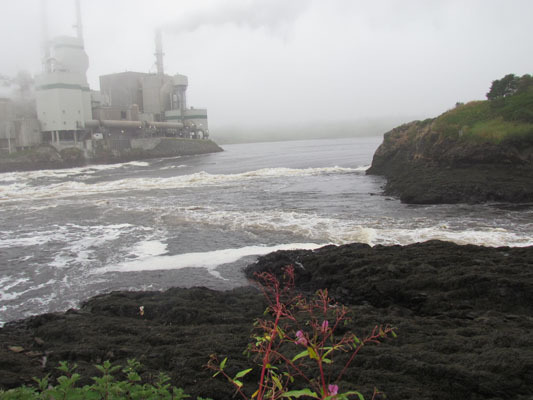 The St. John's River flows through the heart of the city and drains into the Bay of Fundy. During low tide, the river sports whirl pools and white water rapids. However, during high tide, the water rises so high, that the river flows up stream for as much as 80 miles--and this happens twice a day. Boaters beware!! August's web page includes August 1 through September 5.